Combining words with actions in a relaxed Bible club atmosphere greatly increases a child’s ability to understand and respond to biblical truths. As you use Bible learning activities or interact with children as they play, color, make crafts, worship, sing, and have fun in learning centers, remember to talk with the children to help them focus on the Bible lesson and the memory verse you are teaching. Use a natural tone of voice. Do not talk down to the child. Encourage Bible learning by talking with the child as he works and plays. 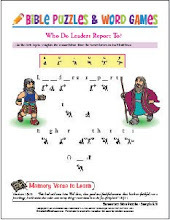 Use your words to focus the child back to the Bible lesson or biblical truth. Relate what the child is doing to what the Bible says. When referring to the Bible, hold it open in front of you. Stoop down to her level and use eye contact when speaking with the child. Use the child’s name frequently, especially at the beginning of your sentences. Say the child’s name and make sure he is looking at you before giving instructions. Use non-verbal signals of touching (if it’s okay with the child) and smiling. Actively listen to how the child responds to your conversation. Repeat the child's words back to him or ask a question about what he said. Recognize and accept the child’s feelings. If she really does not like coloring, give her another activity to do. Use praise and encouragement, focusing on the child’s strengths. As you play with children during your Bible club meeting, encourage them to talk about the lesson theme, the Bible story, or the memory verse. Keep the focus of each activity on God, Jesus, and the Bible. Smile as you talk about God's love for each person. After all, you're modeling the love of Jesus as you sing, play, pray, and worship with the children during your Bible club meeting!